Even though the Cassini spacecraft’s mission ended a little over a week ago on September 15th, 2017, images are still being released of the amazing elements of our solar system that were captured! 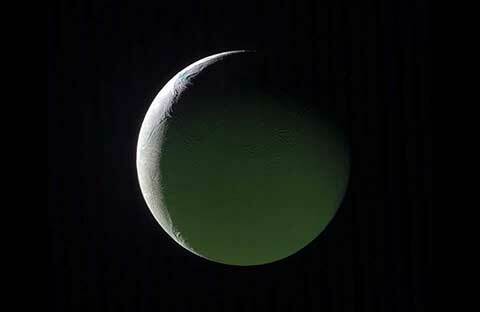 The sixth largest moon of Saturn, Enceladus, was a prime subject of observation for Cassini throughout the mission. Enceladus orbits Saturn between the moons Tethys and Mimas within the planet’s main ring (the E-Ring). Cassini observed erupting geysers on the surface of Enceladus that continuously shoot water vapor and ice into space! These geysers were found to create an area of fine dust particles surrounding Enceladus that provide some of the material for Saturn’s E-ring. Enceladus is one of the brightest objects in the solar system due to its icy surface reflecting most of the sunlight that hits it and houses many other interesting features. This image captured 110,000 miles away from Enceladus is a composite of images from Cassini’s narrow-angle camera taken on March 29th, 2017. The view of Enceladus is taken from the hemisphere that always faces Saturn. Everything besides the bright crescent is lit by sunlight reflected from Saturn.